Sun., Jan. 20, 2019, 6:46 p.m.
Ky Bowman scored 37 points and Jordan Chatman gave Boston College the lead for good by hitting three straight 3-pointers during a 21-4 run to start the second half, and the Eagles held on to beat No. 11 Florida State 87-82 on Sunday in Boston. 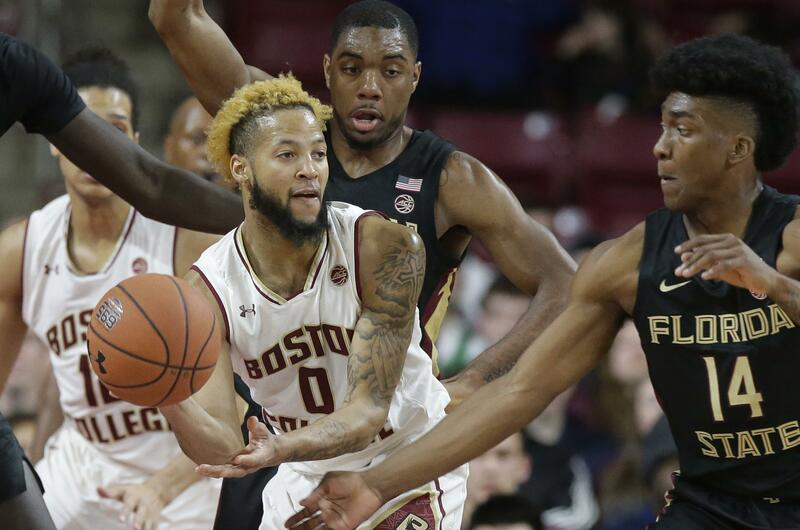 Boston College (10-7, 1-4) led by nine with 1:27 left before a pair of turnovers against the full-court press allowed Florida State to make it a four-point game. But Wynston Tabbs made a 3-pointer with 24 seconds remaining to turn back the rally and snap the Eagles’ five-game losing streak. NO. 15 MARQUETTE 79, PROVIDENCE 68: Sam Hauser scored 25 points, Markus Howard added 24 points and nine rebounds and Marquette rallied past Providence in Milwaukee. After honoring former star Dwyane Wade with a celebration that included a halftime tribute, Marquette (16-3, 5-1 Big East) surged and improved to 13-0 at home. Nate Watson tied his career high with 21 points for Providence (11-7, 1-4). NO. 23 IOWA 95, ILLINOIS 71: Freshman Joe Wieskamp matched a career high with 24 points and Iowa routed Illinois in Iowa City, Iowa. Isaiah Moss scored a season-high 21 points and Luka Garza added 20 for the Hawkeyes (16-3, 5-3 Big Ten). They shot 68 percent, hit 12 of their first 14 3-point attempts and 15 overall. Ayo Dosunmu scored 15 points for Illinois (5-13, 1-6). Published: Jan. 20, 2019, 6:46 p.m.